Site name and description: ModCloth is an e-tailer offering small/indie designer fashions and vintage clothing and accessories for women. In their own words: “Independent designers for distinctively daring, uniquely ‘you’ items!” They also encourage customer engagement via product reviews, a “style exchange” — group photo sharing via Flickr, and their “Be the Buyer” program, where customers can vote and comment on potential new items. Design Overview: Their design is simple yet feminine and playful, and easy to navigate. Important customer information (shipping, return policy) is easy to find and static on all pages. 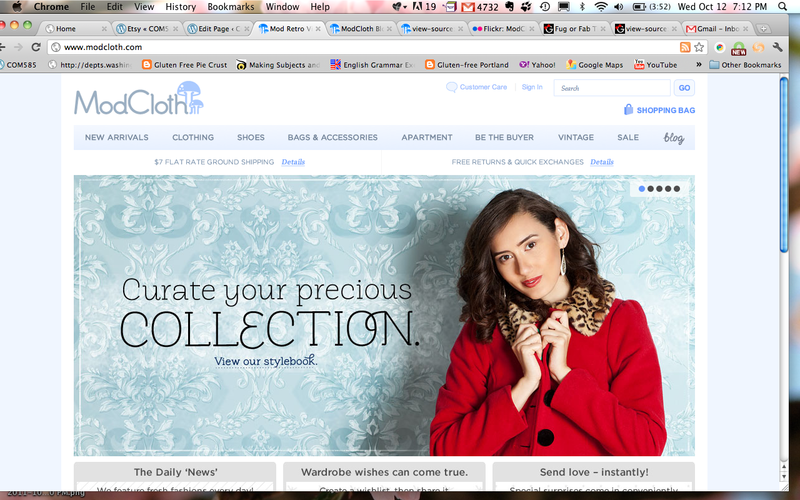 Their homepage offers a rotating slide show featuring new styles, themes and collections. Audience: Style-conscious women 18-40 interested in affordable and vintage fashions, from small or independent designers. Business/Site Goals: Showcase and support new, independent designers, make money through the sale of clothing and accessories, cultivate community with their customers. Their website features a WordPress hosted blog, as well as a blog roll, snapshots of recent tweets, and easy tools for customers to share items/experiences via Facebook, Twitter, YouTube and Polyvore. The blog is also connected to Tumblr, and features a blog roll and recent tweets. WordPress blog and RSS, shopping cart.